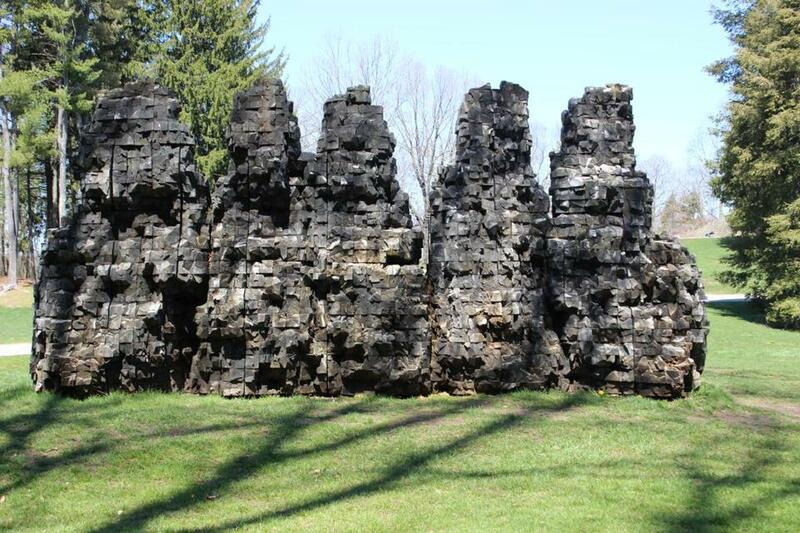 Ursula von Rydingsvard’s “ence pence,” at the the deCordova Sculpture Park and Museum. LINCOLN — There is a rock formation on an escarpment of the Blue Mountains in my native Australia known as “the Three Sisters”: Three sandstone protrusions loosely resembling human figures, faceted and mottled by erosion, overlook a deep ravine. Tourists arrive at nearby lookout sites to get a view. This imperious, enduring sorority always comes to mind when I see Ursula von Rydingsvard’s “ence pence,” a sculpture that stands on a high mound near the entrance to the deCordova Sculpture Park and Museum, and that seems more impressive every time I see it. The “sisters” in von Rydingsvard work are five, not three. And they are not really intended to represent sisters; they’re abstract. But like those formations in the Blue Mountains, they do have a quality that is old, disinterested, and watchful. Von Rydingsvard won the prestigious Rappaport Prize in 2008 and was the subject of a memorable show at the deCordova in 2011. She was born to a Polish mother and Ukrainian father in Deensen, Germany, in 1942. Her father survived several years of forced labor in Nazi camps. After the war, the family (Ursula had five siblings) moved through eight makeshift refugee camps before finally arriving by ship in New York. For the past 34 years, von Rydingsvard has lived in Brooklyn, and year by year, her sculpture has become more ambitious. (She just had a major new bronze, “SCIENTIA,” installed at the Massachusetts Institute of Technology’s McGovern Institute for Brain Research). “Ence pence,” which is now almost 20 years old, still feels like a key work. It was made with beams of milled cedar. Using a circular saw, von Rydingsvard shaped and roughed up the wood, then stacked and glued it in place. At the end of the process, when the form she desired was achieved, she covered every exposed surface in powdered graphite. Seeing the work at the deCordova, especially against an incandescent backdrop of fall leaves, it’s hard not to be moved. The sculpture’s richly faceted surface catches and scatters the light in ways that bring to mind the early, somber-colored Cubism of Picasso and Braque. The graphite accentuates both the grain of the wood and the crude cuts of the chain saw. The tension between your awareness that the piece is a thing made by human hands and the strange feeling that it might have occupied this place, in this way, for centuries, is never quite resolved.